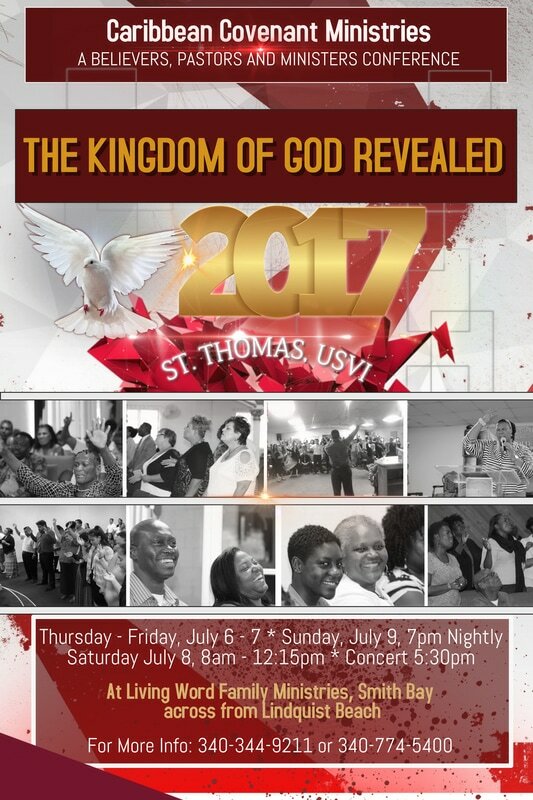 Bishop Ahmed Screven, Director of the St. Thomas Christian Fellowship Mission conference 2017 with a delegation of 20 persons out of the U.S.A. and Pastor Oral Hazell of the Global Life Church invite you to the outreach at Emancipation Garden, Wednesday, July 19, 1:00 pm to 3:00 pm and following an Evening Worship Service, at 7:30 pm, @ Global Life Church, 5-2 Estate Raphune, Weymouth Rhymer Highway St. Thomas. 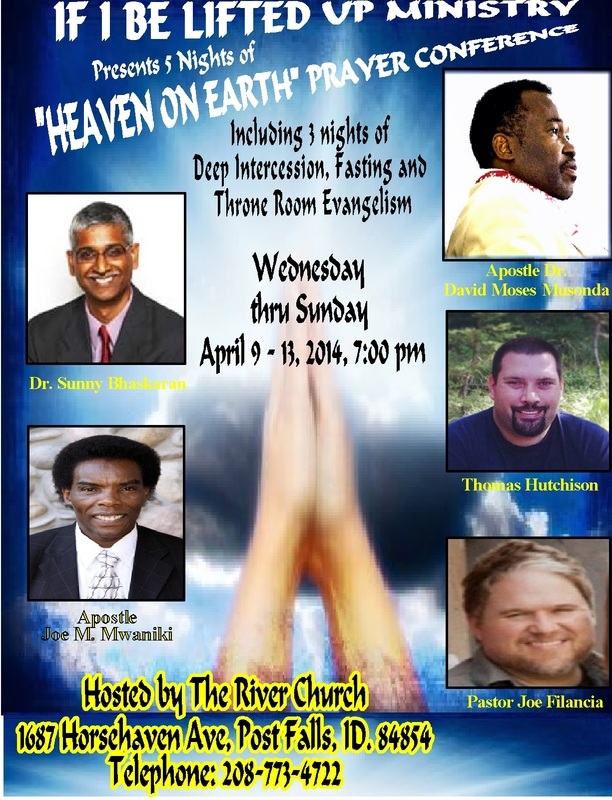 Come and be mightily blessed. For more information visit or www.oralhazellministry.org. or call (340) 774-5400. Pastors Oral & Everine Hazell and the Global Life Church family invite you to their Holy Convocation 2017. 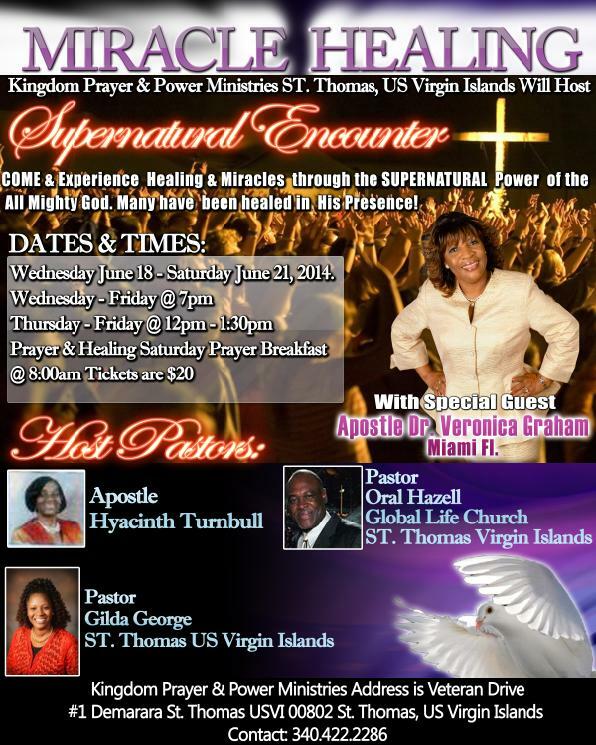 This is a time of prayer and fasting for the Virgin Island & the United States of America. 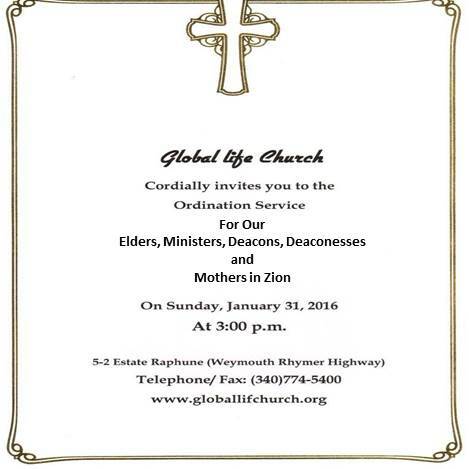 The Service will be held on Sunday, January 15, 2017, 9:30 am thru 6:30 pm at Global Life Church. 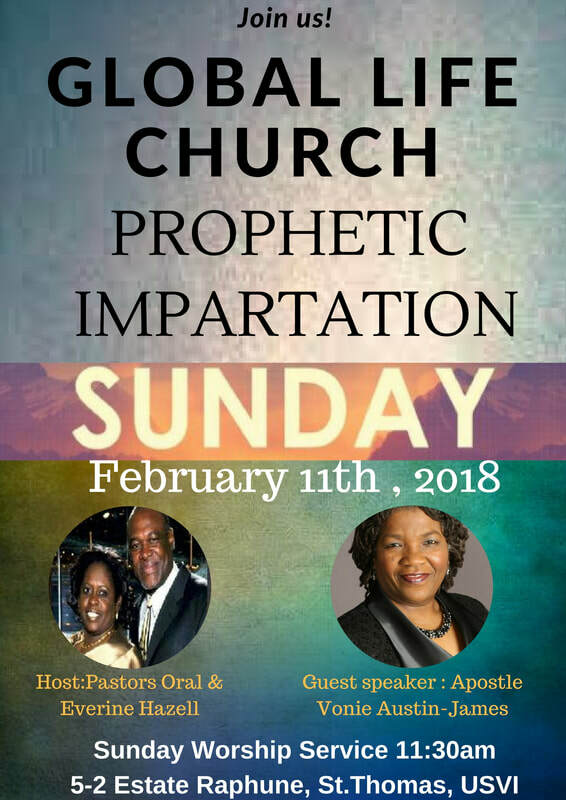 The Guest Speakers are: Apostle Evelyn Turnbull of Harvest Helpers Ministry St. Thomas, VI, Minister Judy Turnbull of Christian Fellowship Ministries Center, St. Thomas, VI and many other speakers. 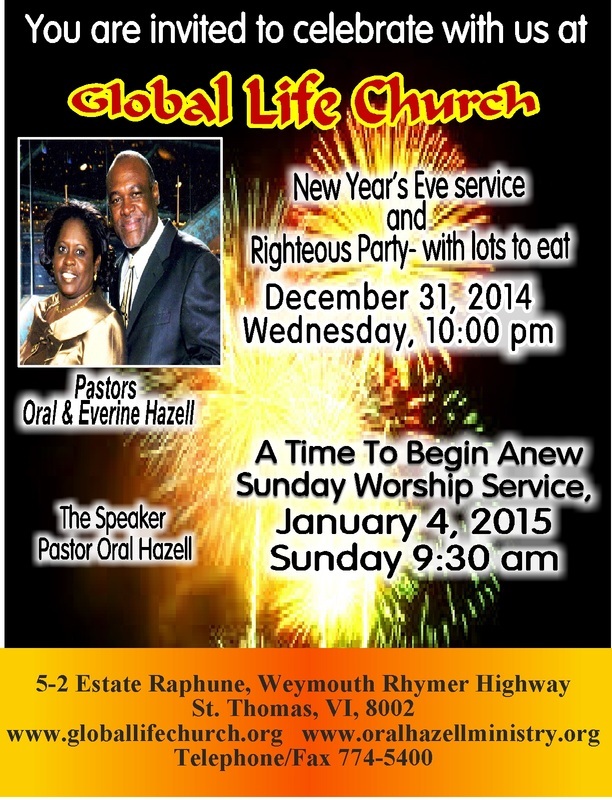 Global Life Church is located at 5-2 Estate Raphune, along the Weymouth Rhymer Highway, St.Thomas, United States Virgin Islands. Come, invite a friend and be blessed. 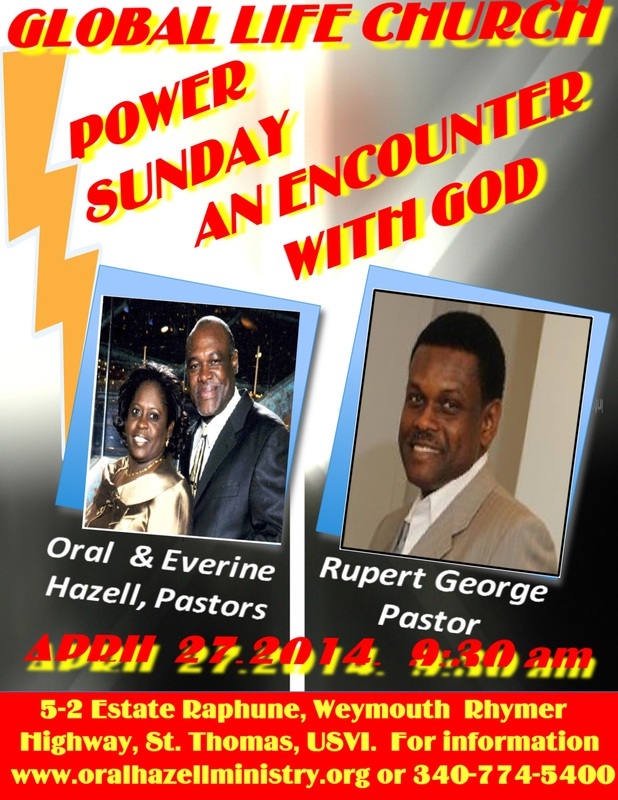 Pastors Oral and Everine Hazell are hosting a “Power Sunday”; “An encounter with God” @ Global Life Church, Sunday, April 27, 2014 @ 9: 30 am. In our Sunday morning service. 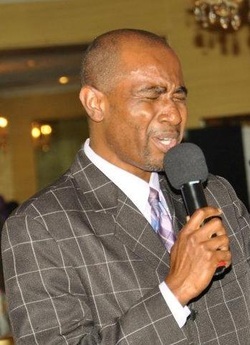 Pastor Rupert George will be our guest pastor. Rupert George has faithfully served God as the senior pastor for Bethel Christian Fellowship, Genesis Worship and Outreach Center and is the founding pastor of Victorious Living Church in Virginia Beach. 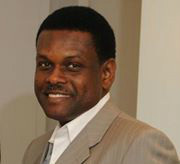 He is also a Life Coach and the owner and Director of PNEUMA Coaching and Counseling Services. Pastor George has been heavily involved in church plants, revitalization and evangelistic community outreaches throughout Virginia. He serves on multiple boards and committees throughout the Eastern Virginia Conference and the International Pentecostal Holiness Church. He is a graduate of Redemption Ministries School of Ministry and ordained under the International Pentecostal Holiness Church. He holds Bachelor degrees in Psychology and Sociology from the University of Tampa, advance degrees in Organizational Management from Golden Gate University and Educational Counseling from Old Dominion University. 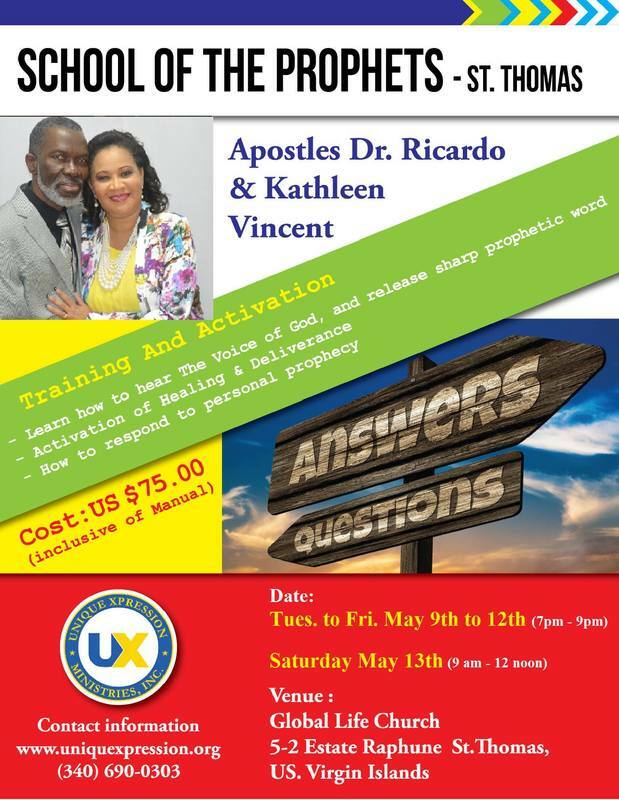 He is a clinic-certified trainer for Evangelism Explosion International. Pastor George possesses an extensive background in church leadership, management, spiritual disciplines and serves as lecturer/instructor for Redemption Ministries School of Ministry. He has also served as adjunct professor of Leadership and Management at New Hampshire College, Florida Junior College and Columbia College. Pastor George is uniquely anointed and gifted as a spiritual coalition builder. His style of ministry is unique to breaking social, racial and denominational barriers; setting a precedence of unity and excellence within the body of Christ. 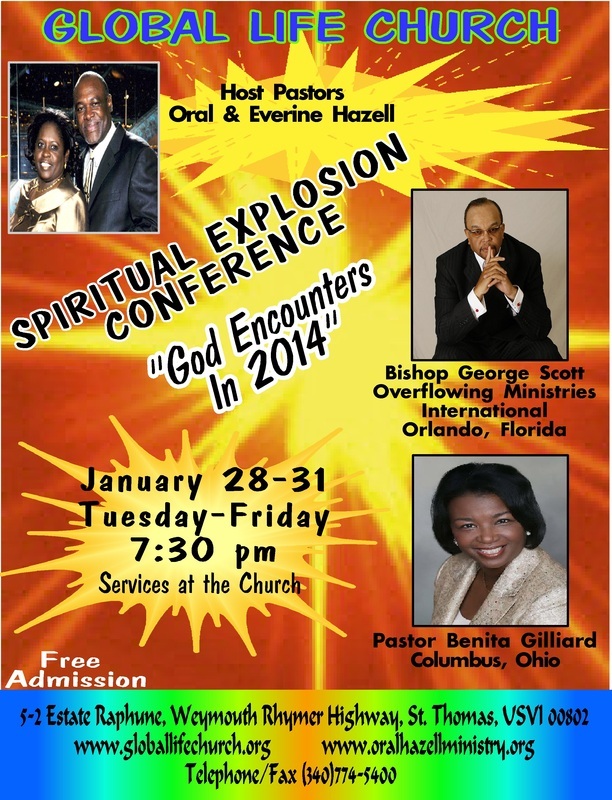 Join us in this service and watch God impact your life in a tremendous and powerful way! 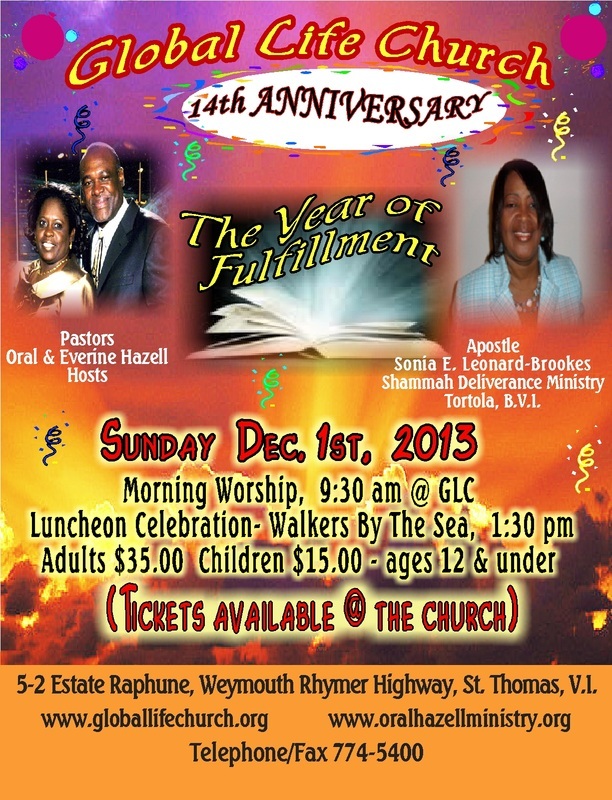 The church is located at 5-2 Estate Raphune, Weymouth Rhymer Highway, St.Thomas, USVI. 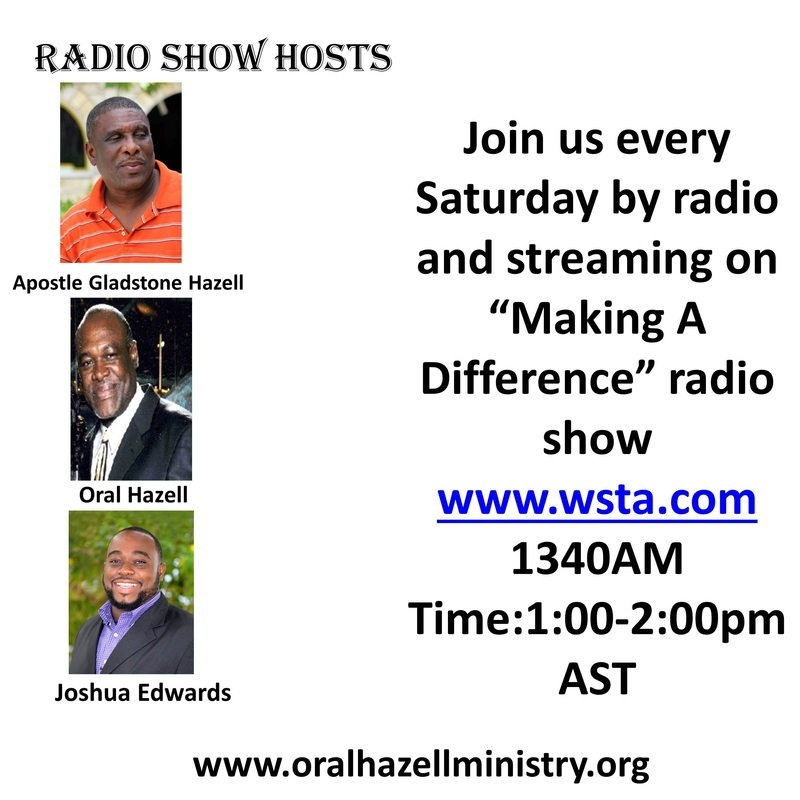 For information visit, www.oralhazellministry.org or call (340) 774-5400. 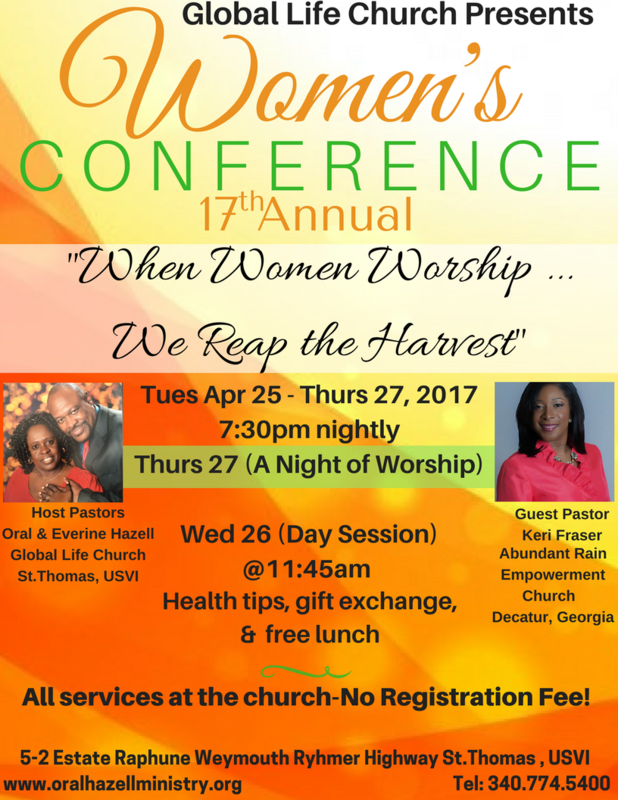 When Women Worship Conference will be held on Tuesday, April 23 through Thursday, April 25, 2013, 7:30 pm nightly at Global Life Church. 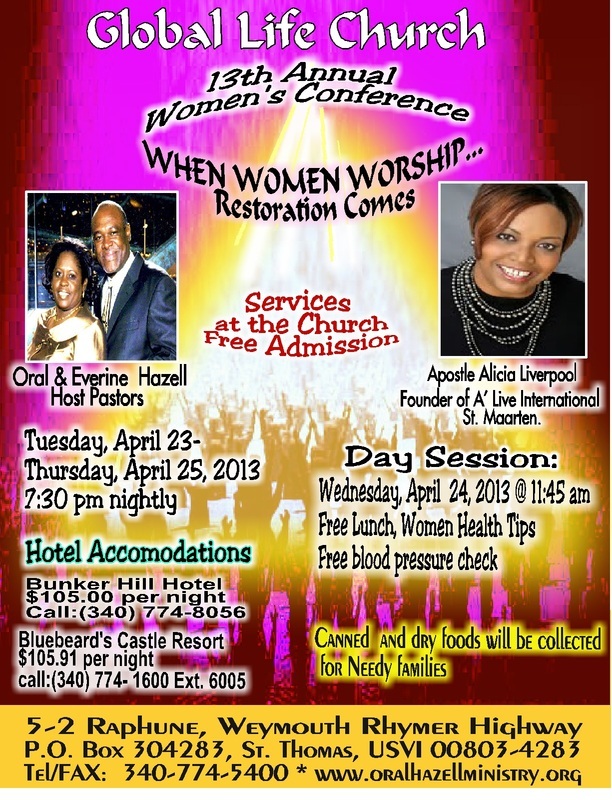 The theme is “When Women Worship… Restoration Comes!!!”. 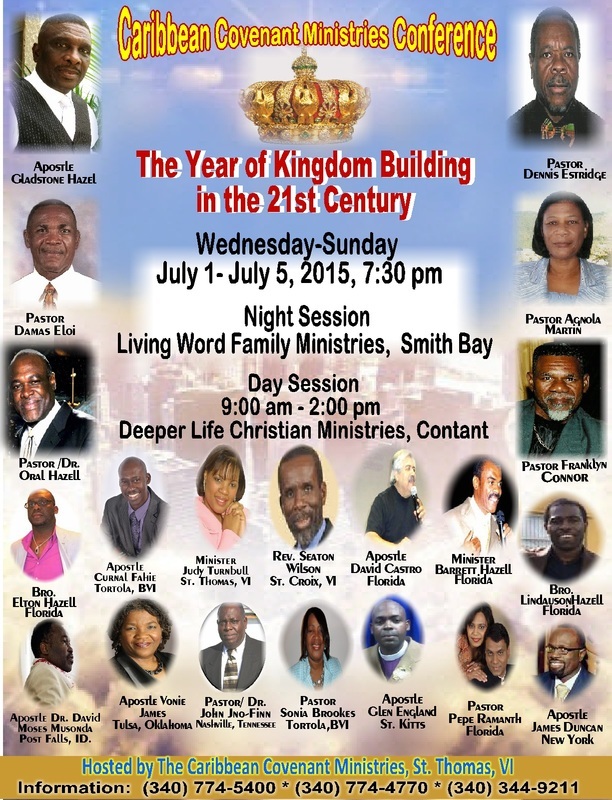 Apostle Alicia Liverpool, Founder of Á Live International, St. Martin, will be our guest speaker. 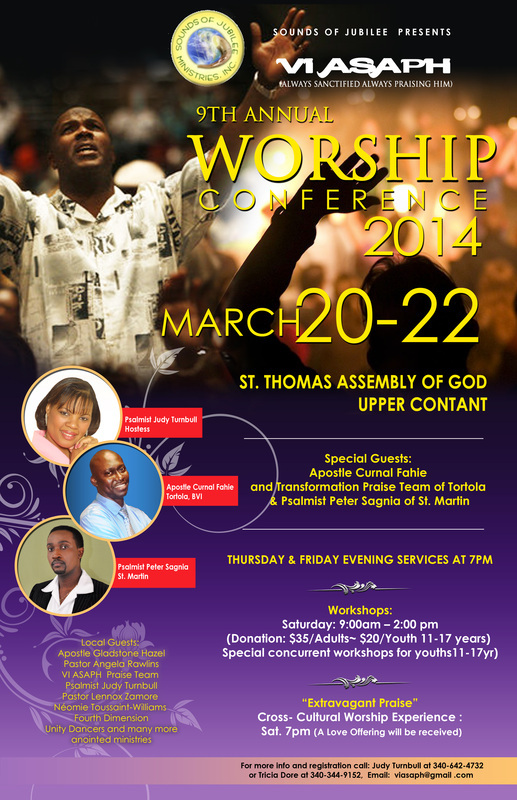 Minister of Music Peter Sagnia of St. Martin will be in attendance. A day session will be held on Wednesday, April 24, at 11:45 am. At the day Session free blood pressure screening, women health tips and free lunch will be provided. All are encouraged to bring canned and dry food for needy families. 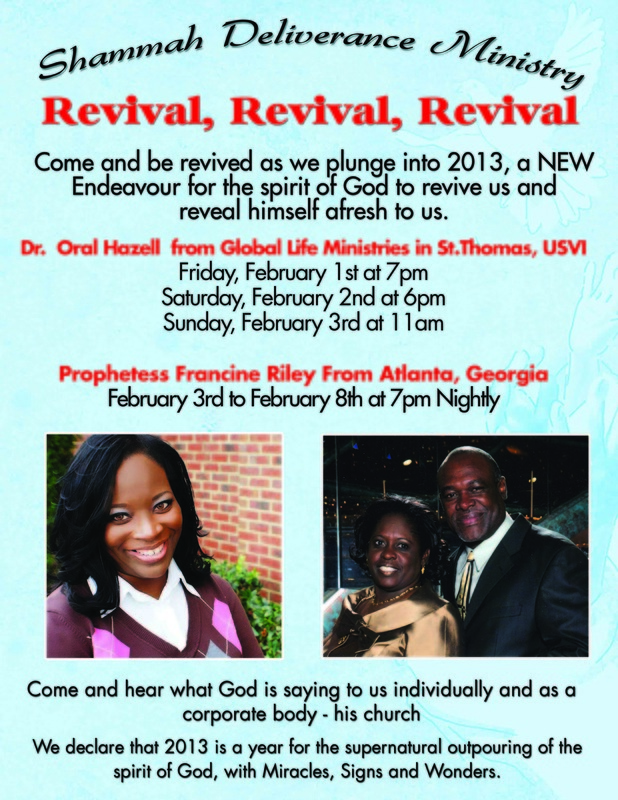 Hosts are Pastors Oral and Everine Hazell. 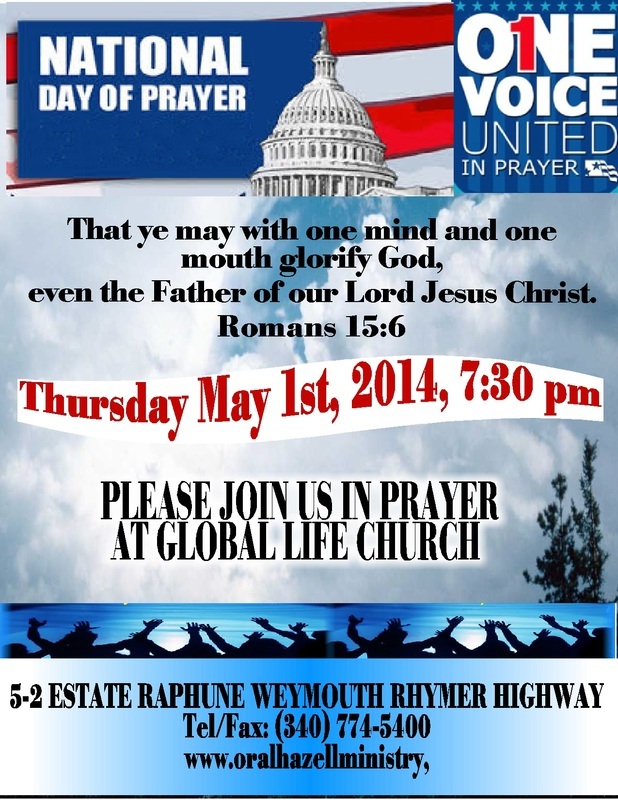 The Church is located at 5-2 Estate Raphune, Weymouth Rhymer Highway. For information call (340) 774-5400 or visit www.globallifechurch.org & www.oralhazellministry.org. 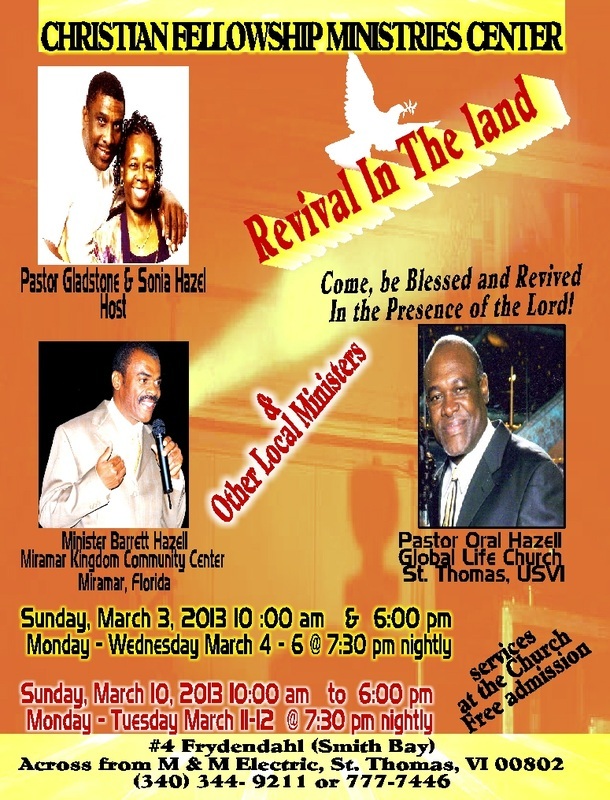 Revival services will be kept at SHAMMAH DELIVERANCE MINISTRY, JOSIAH’S BAY, TORTOLA, with Pastor Sonia Brookes. 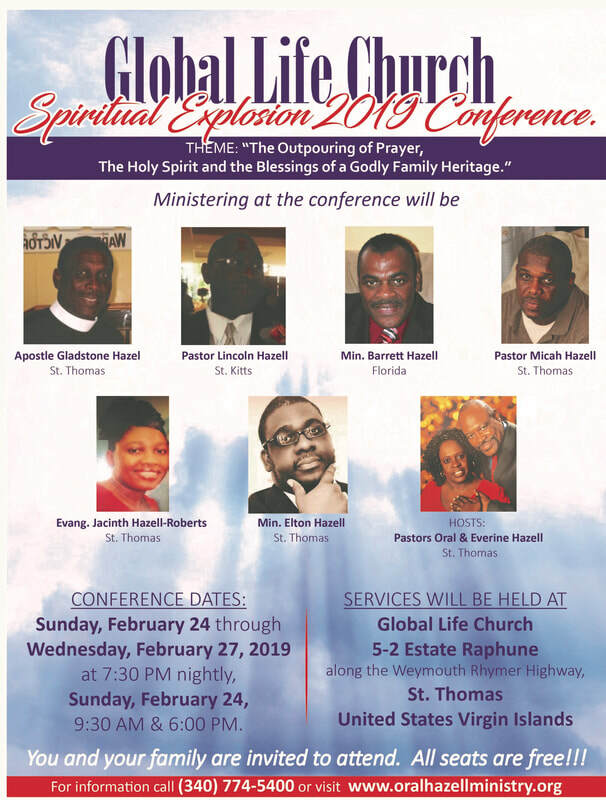 Pastors Oral Hazell, Global Life Church, St. Thomas, VI, will be the guest speaker on Friday, February 1 at 7:00 pm, and Sunday, February 3 at 11 am, an Ordination Service will be held Saturday February 2, 6 pm. It is the place to be if you mean business with the King in 2013. For information (340) 774-5400 or visit www.oralhazellministry.org. 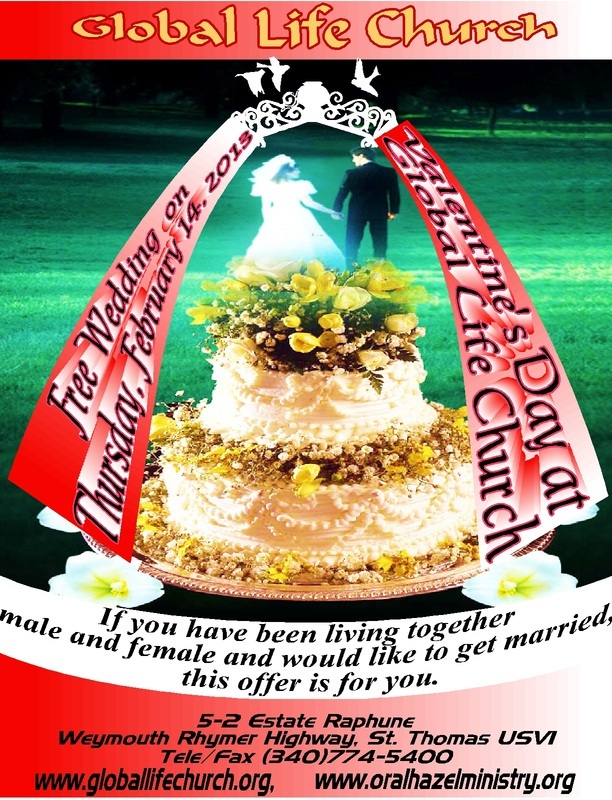 Pastor Oral Hazell, Global Life Church, will conduct free marriage ceremonies on Valentine’s Day, February 14th, 2013 for unmarried couples who are living together. 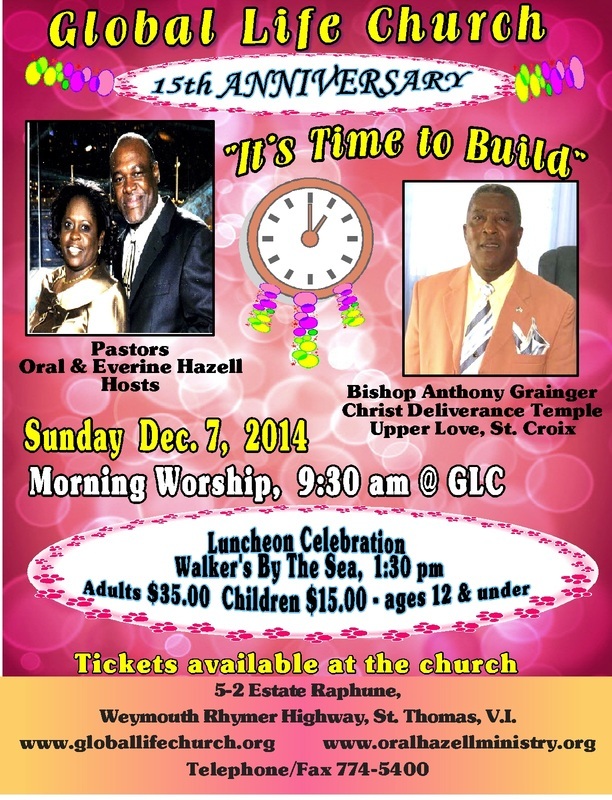 The church is located at 5-2 Estate Raphune on Weymouth Rhymer Highway, St.Thomas USVI, 00802. 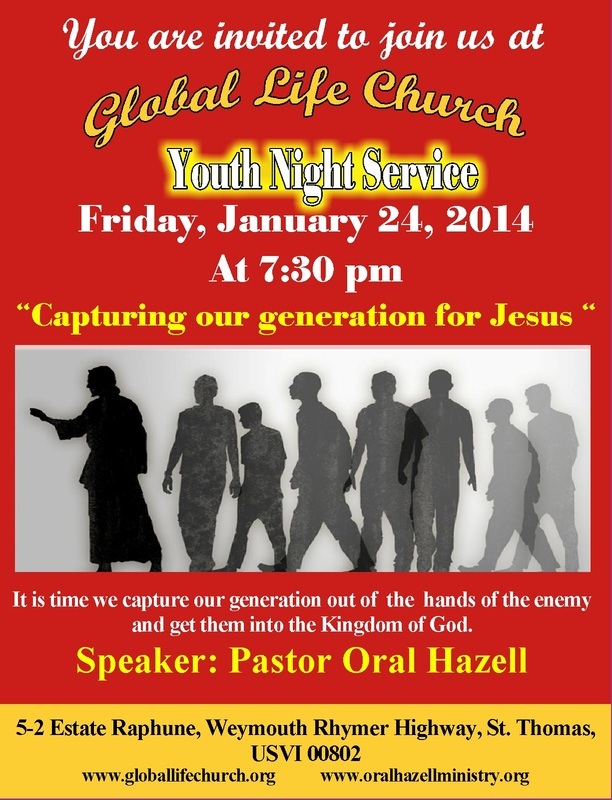 For information call (340)774-5400 or visit www.globallifechurch or oralhazellministry.org. Join us tomorrow: Friday, October 19th, 2012 @ Global Life Church, St. Thomas Virgin Islands as we pray, praise, worship and testify. The time: 10:00pm until 5:00am. 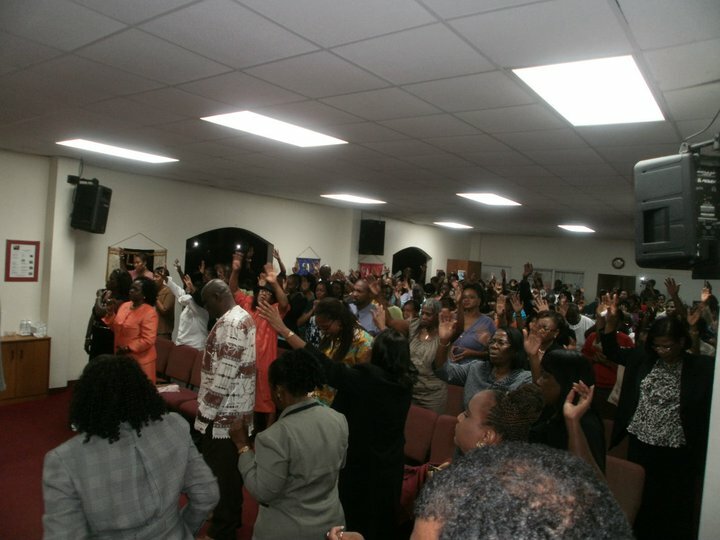 Power Day praise night. There will be light refreshments. Get your sleep and be ready to rumble. 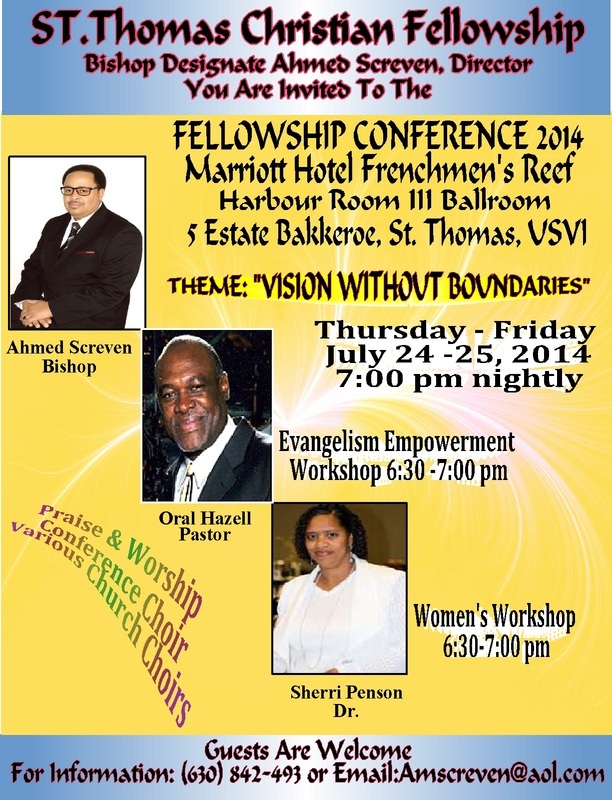 There will be worship from different churches in the VI. Pastors Oral & Everine Hazell invite you to “Power Week" which will be held on Sunday, September 30th @ 9:30 am and Sunday evening service @ 7:00 pm to Thursday, October 4th, 2012 at 7:00 pm nightly. 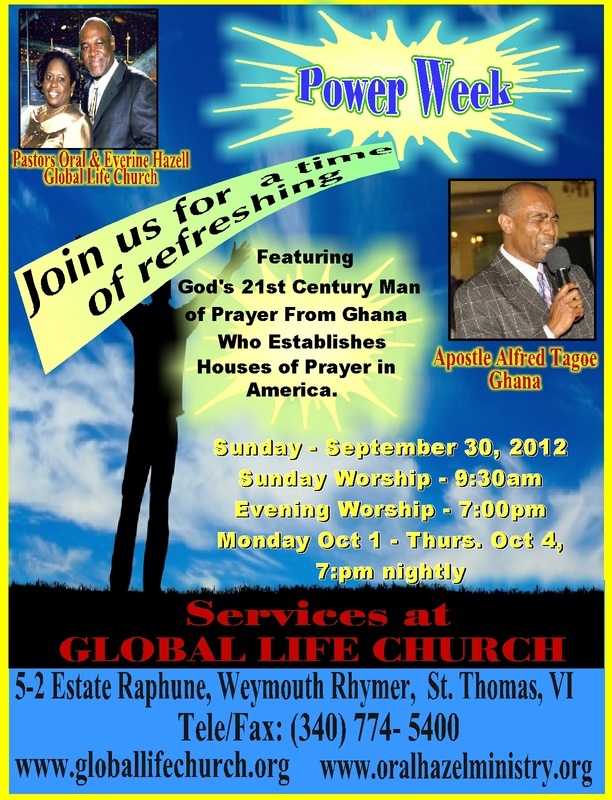 The Guest Speaker: Apostle Alfred Tagoe, Director of Voice of Revival Ministries, Columbus, Ohio. Tagoe, is the founder and director of Voice of Revival Ministries; a non-denominational Apostolic Prayer Ministry dedicated to the cause of personal, City, and National revival. He is a graduate of World Harvest Bible College with a diploma in Pastoral Studies, and Franklin University with a Bachelor of Science in Organizational Communication. He has served in many leadership roles, especially in the area of prayer, ever since God birthed a spirit of prayer and revival in his heart in 1994; and until recently was the Director of Prayer for Metro Harvest Church, the inner city ministry of World Harvest Church under the leadership of Pastor Rod Parsley. His passion is to witness the last great awakening and revival; and help the Body of Christ rediscover their original purpose of intimacy with their creator God, and His Son Jesus. His mission is to “prepare the way of the Lord” (Luke 3:4) and “make ready a people prepared for the Lord” (Luke 1:17). Tagoe currently resides in Columbus, Ohio with his lovely wife Angelina and three children Jezaniah, Jaeda, and Joshua. 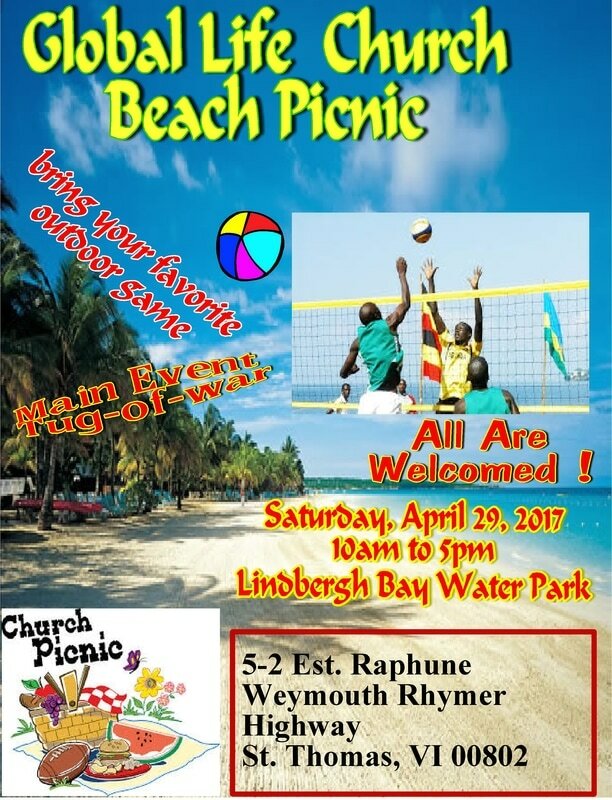 Services will be held at Global Life Church; 5-2 Estate Raphune along the Weymouth Rhymer Highway, St. Thomas United States Virgin Islands. Admission is free. For information call (340) 774-5400 or visit www. globallifechurch.org or www. oralhazellministry. org . 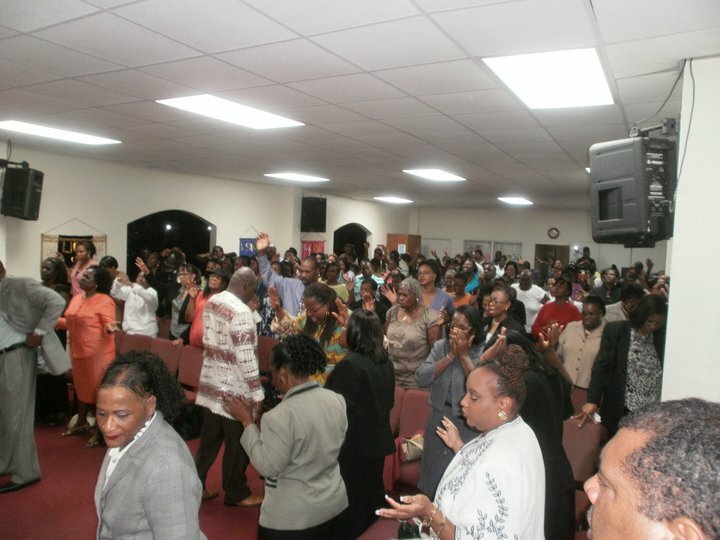 Come and experience the Power of Prayer and your Supernatural Breakthrough in 2012! 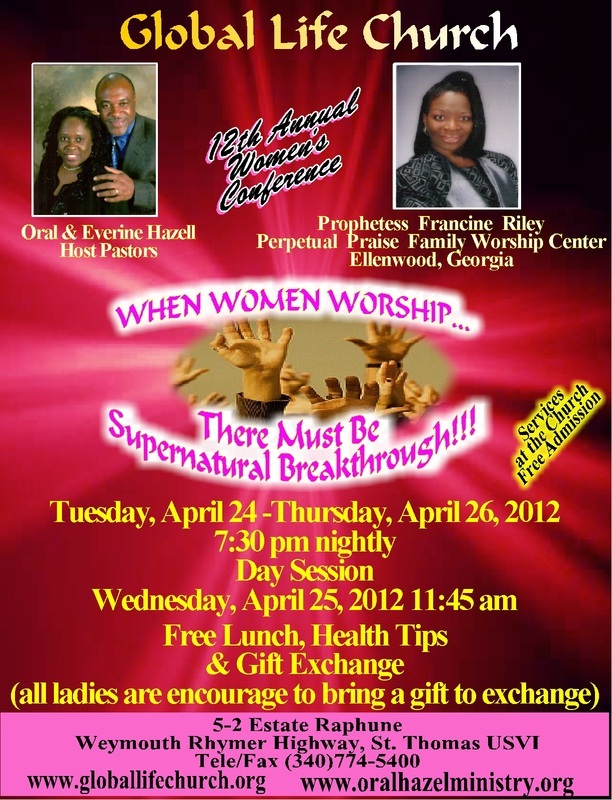 Pastors Oral & Everine Hazell invite you to “When Women Worship … there must be Supernatural Breakthrough" Tuesday, April 24th to Thursday, April 26, 2012. Time 7:30 pm nightly. 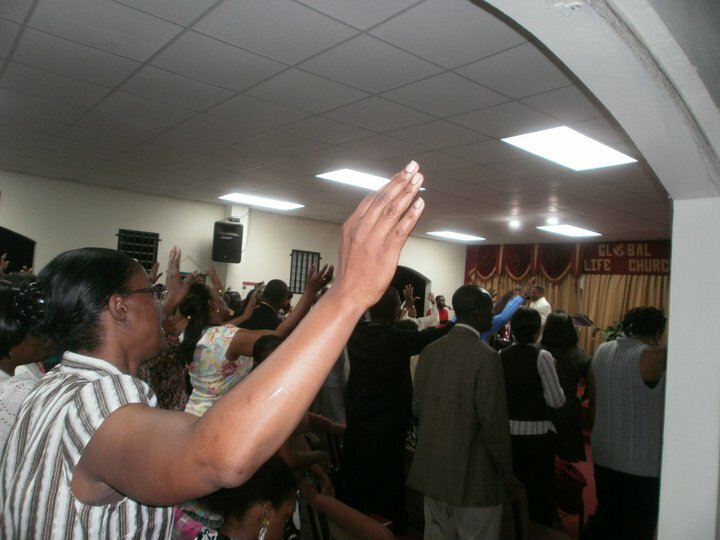 Day session and free lunch; Wednesday, April 25, 2012: 11:45am. 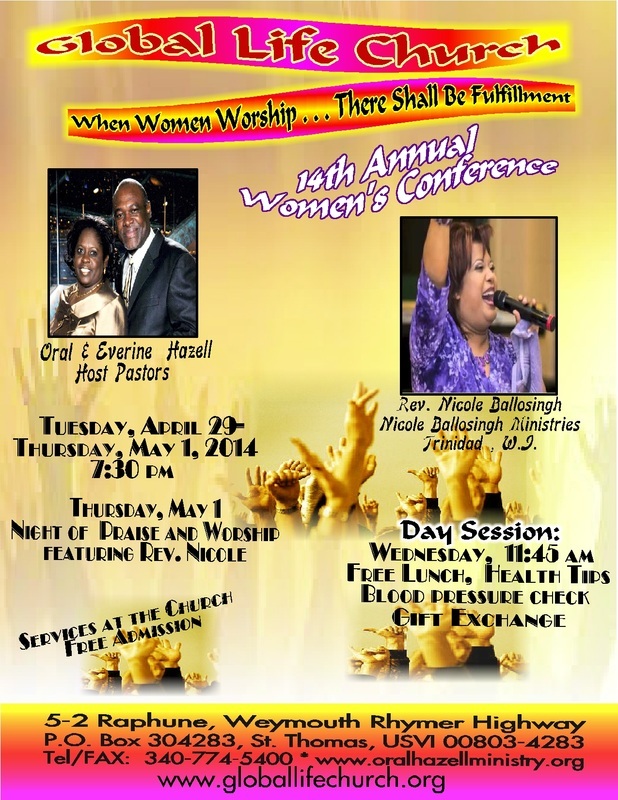 The Guest Speaker: Prophetess Francine Riley, Perpetual Praise Worship Center, Ellenwood, Georga. 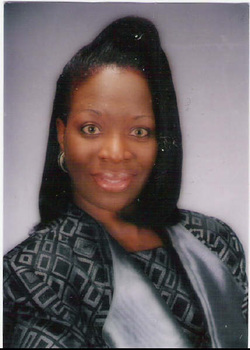 Prophetess Francine Riley, a native of New York presently serves as Pastor and Founder of Founder of Perpetual Praise Family Worship Center, Inc. and CEO of Perpetual Praise Ministries, Inc.
She has developed and founded several other ministries and educational systems designed to equip ministers, youth and women. 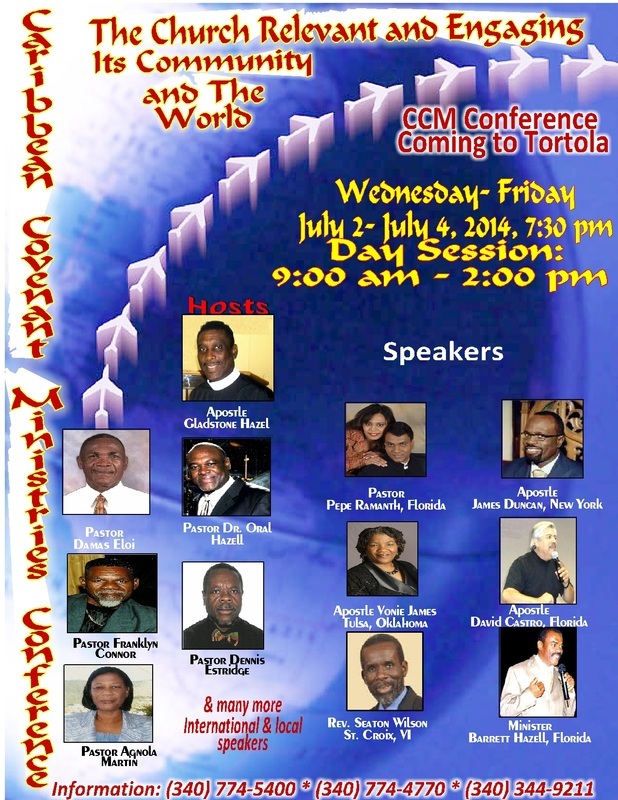 These ministries include God’s W.I.L.L. 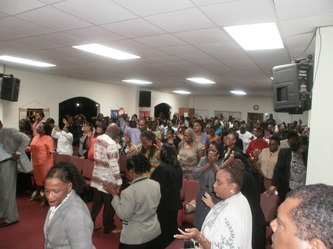 (Women In Local Leadership) International Ministries, Chosen Youth of Destiny, Perpetual Praise Women’s Covenant Ministries, and Perpetual Praise School of Ministerial Alliance. 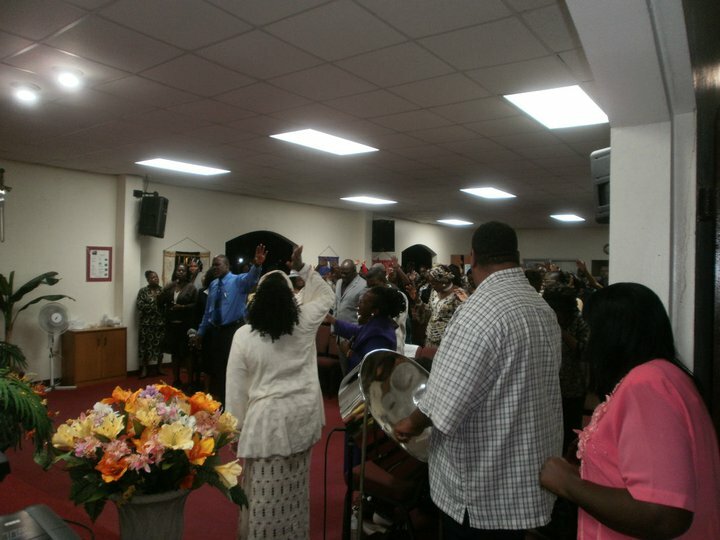 Prophetess Riley’s academia matriculation includes: a BA degree in Religious Studies (Georgia State–Atlanta, GA), a Master of Divinity and Master of Arts in Christian Education (Interdenominational Theological Center—Atlanta, GA). She holds an honorary Doctorate of Divinity (A Ray of Hope Theological Seminary & Bible College and International School of Divinity). Her travels have taken her far beyond the United States into countries and continents such as Russia, Bermuda, Italy, London, Africa, Bahamas, Germany, New Zealand, and Mexico. She is thoroughly convinced of her call to the nations of the earth through the preaching and teaching of the gospel of the Kingdom of God. Prophetess Riley’s profound ministry operates with a unique grace of knowledge, wisdom and prophetic insight that is both life-changing and captivating. The prophetic flow affects entire atmospheres catapulting entire ministries, people and life assignments into greater dimensions of fruitfulness and effectiveness. She is not only a minister assigned to the masses but also to the remnant of people overlooked, distraught and cast away. She extends ministry beyond her normal weekly responsibilities of pastoring into shelters, prisons (including detention/juvenile centers) and transitional programs. Focused and determined, she remains faithful to the call of heaven training and equipping 21st century leaders for the ushering in of our Lord Jesus Christ. She brings with her ministry a word of healing, restoration, renewal, and wholeness. 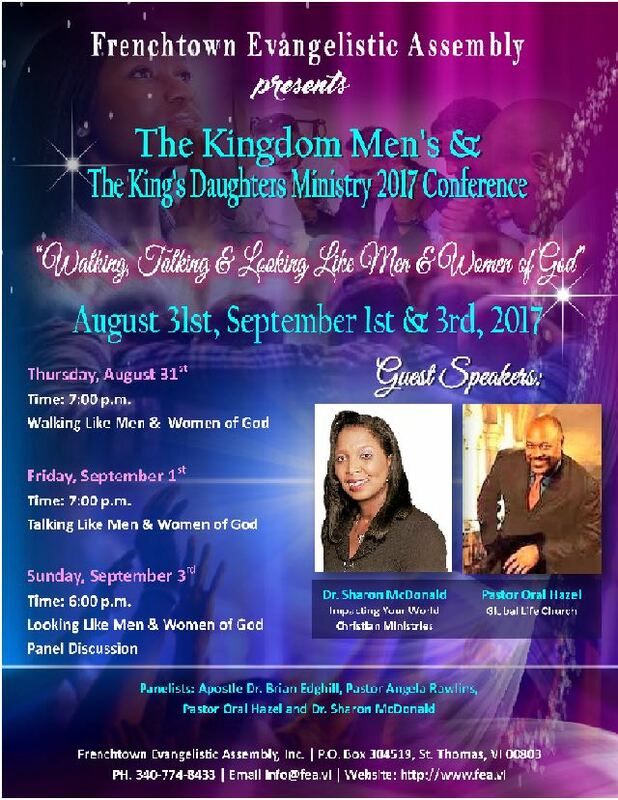 Prophetess Francine Riley resides in Ellenwood, Georgia, and is the proud mother of two anointed children, Marquis and Janita. Services will be held at Global Life Church; 5-2 Estate Raphune along the Weymouth Rhymer Highway, St. Thomas United States Virgin Islands. Free Admission. For information call (340) 774-5400 or visit www.globallifechurch.org or oralhazellministry.org. 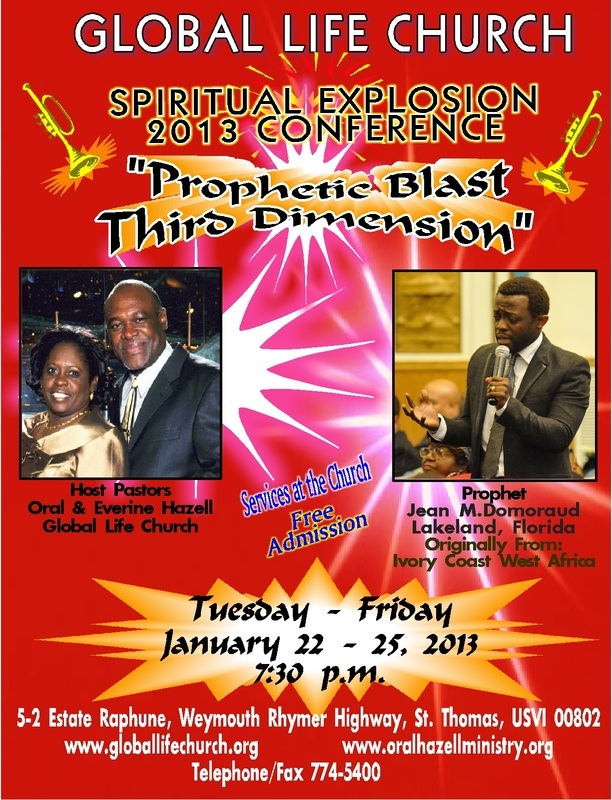 Come and experince your Supernatural Breakthrough in 2012 !!!! 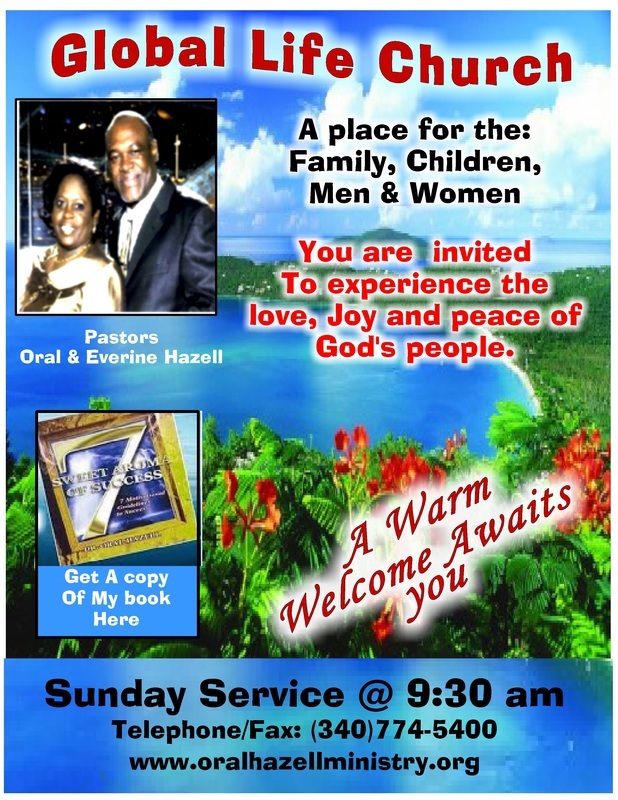 Pastors Oral & Everine Hazell invite you to “REFRESHING SUNDAY SERVICE" Sunday, March 4th, 9:30am, 2012 . The Guest Speaker, Apostle Alicia Liverpool , founder of . A’Live International, in the island of St. Maarten. Alicia M. Liverpool is radiantly A’LIVE! Her life-giving spirit and dynamic personality are transformative, often challenging the mind and inspiring the hearts of many to aspire to better things. Alicia, having been inspired by the ‘better’ of the New Covenant, founded A’Live International – a development organization and premier provider of life-enriching services for the betterment and well-being of the whole person – body, soul, and spirit. A’Live, aptly named, is all about change and socially responsible actions to make the world a better place for everyone. As one of the leading respected voices of our time, Alicia is without a doubt a trailblazer, a revolutionary, David-hearted worshiper and leader who bears the heart of a king and the anointing of the King for the purpose of building and increasing His Kingdom. An esteemed wife and mother of three, Alicia’s life is governed by the principle: “first give yourself to the Lord, and then to His people” (II Corinthians 8:5, paraphrased). This is what she terms as the king-priest paradigm that incorporates a balance of worship and work. It is a message she expounds with great anointing and passion, having been called by God to equip the body of Christ – God’s kings and priests to do the work of this ‘more excellent ministry’ (Heb. 8:6). This role of equipper is primarily fulfilled through ‘Expressly Yours, KP’, an A’Live initiative that provides coaching and grooming of kings and priests to become the glorious expression of the fullness of Christ. In addition to her role with A’Live, Alicia is also the President/Senior Ambassador of The David Company, a covenanted community of kings and priests in relationship and partnership with the King for the increase of His Kingdom in the earth. She and her husband Dennis make their home in beautiful St. Maarten with their three children. Services will be held at Global Life Church; 5-2 Estate Raphune along the Weymouth Rhymer Highway, St. Thomas United States Virgin Islands. Free Admission. For information call (340) 774-5400 or visit www.globallifechurch.org or visit or oralhazellministry.org.